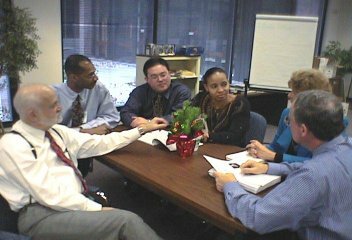 To develop the Narrative History of SSA during the period 1993-2000 a workgroup of six members was assembled in September 2000. The group planned the organization and structure of the narrative, conducted background research, and wrote and edited the Narrative. The group was put together under the direction of the Deputy Commissioner for Human Resources (DCHR) at SSA and consisted of outstanding employees from the various developmental programs operated by DCHR. 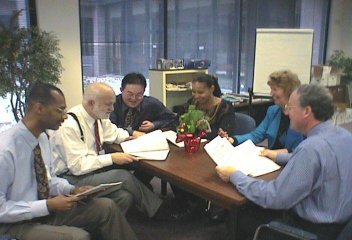 The Workgroup first assembled in early September 2000 and completed its work early in January 2001. Here are the six members of the SSA Administrative History Workgroup, along with brief bios of their SSA careers as of January 2001. 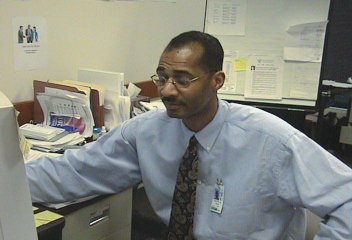 Melvin Files joined SSA as a Records Analysis Clerk in the Birmingham Program Service Center in August 1990, moving to the position of Benefit Authorizer in January 1991. 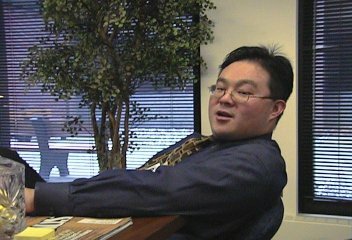 He began the first in a series of diverse assignments in SSA's National Leadership Development Program in April 2000. His Federal service began in May 1984 as a sailor in the U.S. Navy and continues through the present as a reservist. Maryanne Lysett is a Management Analyst in the Office of Disability and Income Support Programs and a recent graduate of SSA's Advanced Leadership Program. 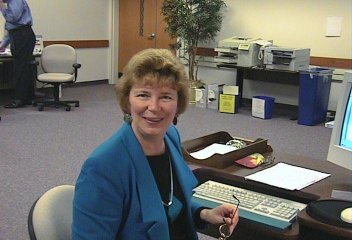 She started with the Agency in March 1976 as a Claims Representative in the York, PA field office. 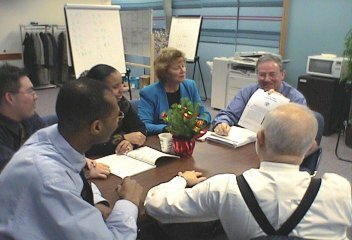 Maryanne worked for 12 years in field offices in the Philadelphia, Chicago and New York regions before moving to headquarters and a staff position in the Office of Workforce Analysis. Lydia Marshall joined SSA in April 1994. Since that time she has worked in the Philadelphia Region as a Title XVI Claims Representative in the Baltimore Downtown Office. She has also served on detail in management positions throughout the field. In March 2000, Lydia was selected to participate in the national Leadership Development Program. Her participation in this program has enabled her to work in various developmental assignments and gain experience throughout the Agency. For the past several months she has been a member of the Clinton Presidential Library workgroup which drafted the History of SSA During the Clinton Years. Bill Shie joined SSA in December, 1999 as a Presidential Management Intern in the Chicago Regional Office. He has so far completed a Title 16 Training Course, and has completed a 5 month rotation in the Chicago North Field Office as a Title 16 Claims Representative Trainee. He comes to SSA from California with degrees in psychology and the law, and has formerly worked lobbying regarding state CPA regulations. Jim has more than 46 years of high level management and staff experience, all in the Atlanta Region. He began his career as a Claims Representative Trainee and subsequently served in the field as a Field Representative, Claims Supervisor, Assistant District Manager and District Manager. His regional office experience includes Staff Director Management, Area Director, Regional Teleservice Director, Disability Program Administrator, Regional Public Affairs Officer and Deputy Assistant Regional Commissioner, Field Operations. He has congressional experience as a LEGIS Fellow. 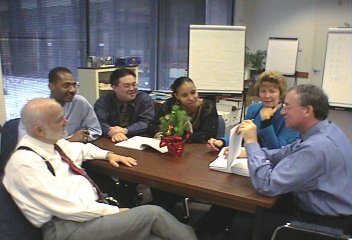 Jim spent four months on detail to the Office of Personnel Management and directed OPM's "Quality Circles" initiative. He also served as a Cluster leader for the Presidential Management Intern Southeast Cluster group. 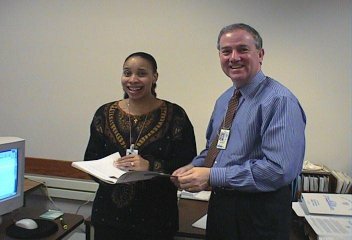 Workgroup Chairman Wayne Harmon, with Lydia Marshall. 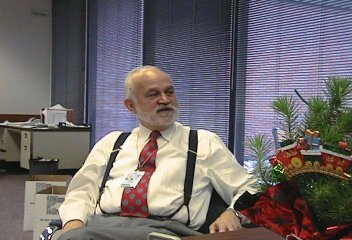 Wayne has been the Director, Regional Office of Quality Assurance and Performance Assessment, in Atlanta for the past five years. He recently completed the SES Candidate Development Program and received his certification from the Office of Personnel Management. One of his assignments in the SES Candidate Development Program was working with the Chief of Staff in the Commissioner's Office in Washington, D.C. Prior to his current position, Wayne served five years as the Executive Officer to the Regional Commissioner in Atlanta. He also served as the Training Officer in the Atlanta Region. Wayne has participated in three national development programs. He has spent 24 years in Operations and 5 years in the organization of the Deputy Commissioner for Finance, Assessment and Management.